Caught up in a world of easy money, designer labels and drug-dealing boyfriends, sixteen-year-old Kyra Jones is living life on the fast track. But when her single mom is offered a job that takes Kyra away from her old Chicago neighborhood, and the drugs and gang violence that go along with it, she finally realizes that there’s more to life than Gucci, Prada and ghetto-fabulous bling. Starting over in a new place, with a new boyfriend, Justin, gives Kyra hope that life can be different. But sometimes the fast life catches up to you. And for Kyra, her only hope is to stay one step ahead of trouble. “Fast Life” is available in paperback and e-book. Kai, a prolific writer that has the keen ability to provoke thought. Two words that best describe her are positive and purposeful. Clear, colorful and insightful are Kai’s writings about the nature of love, human relationships and the human condition. Her words deepen one’s understanding every time they are read. Whether her words are in the form of articles, blogs, poetry, Tweets, or FB posts, they are talked about during the week and are usually great conversation starters. Come and enjoy the world of Kai Kaiology Mann. Click the link below to read an excerpt from Abandoned Property by Kai Mann. This is the message that popped up in my Yahoo chat. I did not recognize the sender so I typed “Hey. Who is this?” then hit enter. I dug back in my memory bank trying to figure out who the hell this person was and how they got my information. I guess I was taking too long to respond because another message chimed in. Not wanting to chat too freely because I was still leery about how and, more importantly, why he sought me out, I left the ball in his court. We chatted for a few minutes, making small talk. We attended the same high school, but he graduated three years after I did. We had several mutual friends. He played football, both in high school then in college, before, of course, he was injured. His photo albums on FB were full of pics of him…and his wife. He was recently married. The wedding photos were beautiful. His dark mocha skin contrasted against his crisp, white tux. She was wearing an off-white strapless gown. Her full breasts were a sneeze away from spilling up and out the dress. Her weave was long, with lots of ringlets. She was happy. Her thick lips stretched across her face in almost every pic. A few days passed. My Facebook alert chirped on my Blackberry. “Friend Request – Kenzu Brantley.” I accepted the request, which I normally did if the person “appeared” to be decent. I was heavy into networking and always looking for more people to share and learn with. Minutes later I received a message in my inbox. Hey. I enjoyed chatting with you the other day. Let’s do that again soon. I carried on with my day – work, school, kids’ homework, cooking dinner, watching television. Yep! Had the regimen down to a science. Since I purchased a Blackberry I no longer needed to spend countless hours on the computer. I mean, I did get on it occasionally, but most all my needs were at my fingertips via Crackberry. “Cricket – Cricket” is the sound of my Yahoo messenger alert. My best friend Lana knew this was the best way to reach me. I’d long since given up on talking on the phone. Text, chat and email were the most effective ways to get my attention. “Hey S. How r u?” she typed. As soon as I ended our conversation, I got another message. This time from him. “Look at this brother trying to have game,” I said aloud to myself. I sat the phone down as I prepared the next day clothes for me and the kids. When I heard the cricket chime more than two times, I made sure to quickly plug in a response so it could look like I was fully attentive. We chatted about things from movies, sports, love and marriage, food and Facebook. To read more, Buy/Download HERE!! Rain grapples with memories of a horrific past that leaves her far from unscathed. After witnessing her mothers gruesome murder as a child, she is now left piecing together the fragments of her shattered psyche as an adult. Quickly, she is drowning in years of frustration and confusion with no promise of relief. Sinister visions and undying spirits haunt Rain relentlessly, driving her deeper into darkness and lunacy. Rains grandmother, GiGi, tries her best to help Rain face the truth, urging her to confront her past, but the past is too painful–it’s easier to hide. As Rain struggles desperately to define herself, she’s forced to brave her live-in siblings: a violent and narcissistic brother, Danny, who resents her weakness and Carmen, her promiscuous and hostile older sister, who wishes Rain would disappear. In her fragile mental state, Rain is ill-equipped to handle the chaos of their ruptured lives. 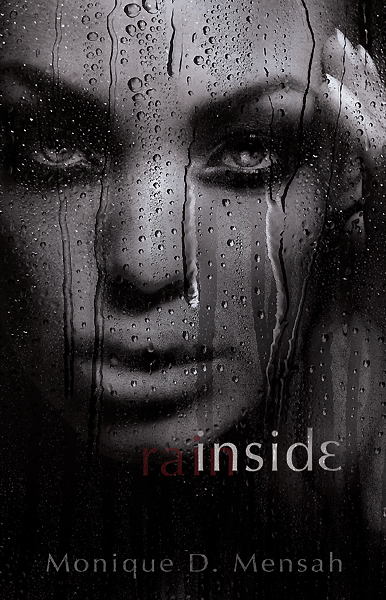 When Rain, Carmen, and Danny are submerged into the horrors of prostitution, drug-addiction, domestic violence, and murder, Rain is left alone to face her internal demons and find her identity, with no one to answer to, but herself. A cold chill invaded her bedroom. The windows were closed and the heat was on, but there was still an unjustified frost that nipped at Rain’s skin as she lay snuggled in her twin-sized bed under her Sesame Street blanket. Living in Detroit, frigid nights could be expected in the dead of winter, but this was different than any other chill she’d experienced; it was eerie. That’s what woke her up. It wasn’t the faint sound of screaming in the near distance or the echo of heavy footsteps pounding the linoleum floors. It was the creepy, cold air that bit at her ears, fingers, and toes. Rain rubbed her eyes and lazily threw the covers off her small body. Her tiny feet dangled from the side of the bed as she sat there for a moment, yawning and wondering how long it would be before it was time to eat her usual Crunch Berries and toast for breakfast. It was dark in her room, and the light from the hallway crept through the crack under the door. She could tell it was still nighttime. She opened her curtains and saw the steel moon staring back at her, confirming her initial thought; it was still the middle of the night. Then she heard it again, thundering footsteps followed by a shrill scream. This time she knew—it was her mother. Rain jumped out of bed and rushed out to the hallway. The light made her squint as her eyes adjusted. She started running down the hall, but quickly slowed her pace to a slow and careful walk. At five years old, she had the senses of a grown woman. She knew her mother was in danger and that she might be as well. Still, her curiosity compelled her forward to find out what was going on. As she got closer to her mother’s bedroom, the noise became louder and clearer. She heard her mother again, but this time she wasn’t screaming. She was talking desperately. Begging. Rain heard a smack, then a crash. The brash voice of a man bounced off the thin walls of the small bungalow. “You think I’m stupid don’t you? I told you last Friday if you ain’t have my money, I was comin’ for you. Gimme my money now!” Smack! To Rain, he sounded like a monster. Like Skeletor, his voice was deep and groggy and sent a cold shiver down her spine. Suddenly, she started to cry. Warm tears staggered down her face, but she managed to remain silent as she kept a slow and steady pace toward her mother’s bedroom.